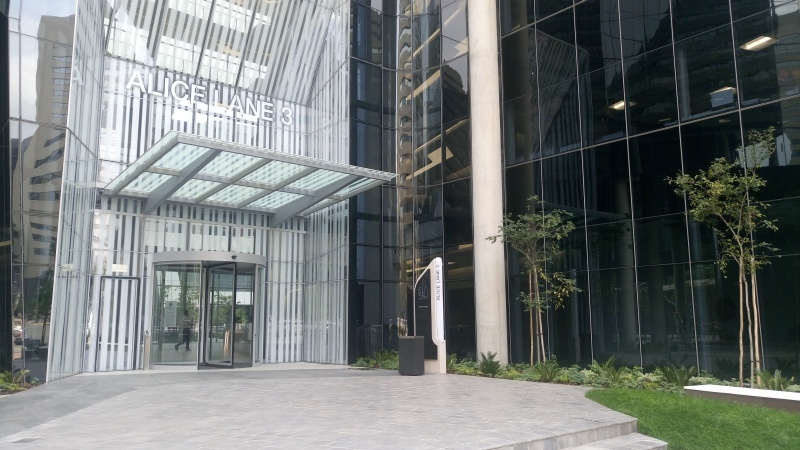 The 18-storey Alice Lane 3, or “Tall Allice”, as the architects at Paragon have dubbed the third and last building to be completed in the Alice Lane precinct, was designed with absolute consideration for the end-user, in this case the Bowmans law firm. Architect Alexandra Slaviero explains that law firms typically have a higher (cellular) office-to-floor plate ratio requirement, and in addition to the density of offices, the client in this case requested views and windows for each unit. Paragon’s solution was to design an H-shaped building with a north and a south wing that are pulled together by a dramatic central atrium. Not only does this shape allow more peripheral space with windows that let in natural light and expansive views over the city, but it also increases the modularity of the building, allowing each floor to be subdivided into offices for up to four separate companies. “This design was practical for the client’s internal operation,” Slaviero states. A unique feature of the building is the glass auditorium, a challenge Paragon took on despite the acoustic challenges that accompany the material. To achieve the optimal sound levels, Paragon worked with acoustic engineer Ivan Lin to incorporate the right amount of sound reflective and sound absorbing surfaces on the walls and ceilings, and bespoke absorption panels were designed to fit the design and layout of the auditorium. The side panels were made of MDF with a white duco finish and acoustic material at the back. These were installed at an angle so that the audience has a view of the outside piazza, but viewed from the front, they overlap to obscure the view to prevent distractions for the speaker on stage. Fully automated blinds provide the option of further privacy. Although the bulk of the modelling of the building was done in Revit, architect Kim Newell used Rhino software for the complex design and massing of the auditorium. According to Slaviero, the professional team was required to all work on Revit as this aided the coordination processes. “Working and managing the Revit models from all the different disciplines allowed a smoother flow of information and clash detection between consultants, thus streamlining the documentation time, improving productivity and reducing rework of items. The consistent use of parametric modelling allowed easy control of elements and the ability to change or update design elements fairly quickly,” she explains. For the facade, flush double-glazed vision and spandrel panels were used. Office spandrel panels were back painted, received insulation and in some cases aluminium pack pans. 1. Blue glass: Cool lite st120 low e safety glass. 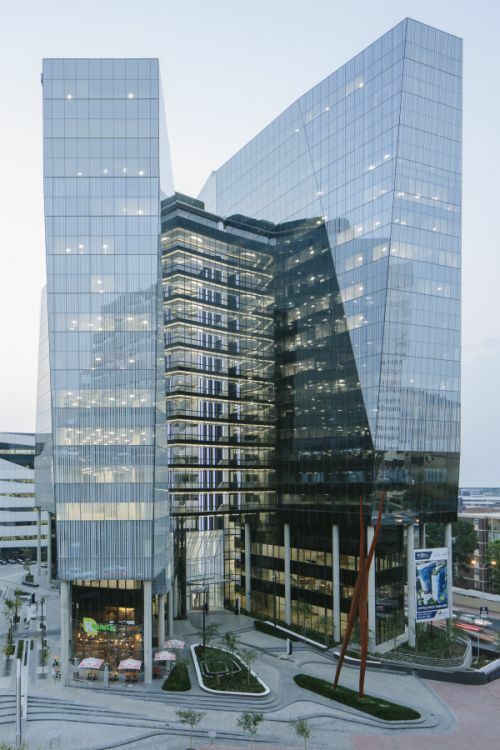 This highly reflective glass assists with thermal performance and internal comfort. 2. White (fritted) glass: Solar e plus grey solar control low e 6mm toughened safety glass with dense white dotted frit to external face. Each of the fritted panels features an individual design with 30% dot coverage. The pattern undulates to create streaks and streams imitating water veins. This effect is particularly visible on a cloudy day, when the silvery blue glass reflects the clouds, only to be broken up by the unsymmetrical composition of the “dot runs”, looking like water flowing down the smooth glass face. Along the lines of the white glass, LED lights accentuate the building form at night. 3. External atrium and pod glazing: Solar e grey solar control low e glass. The incorporation of this glass highlights and visually separates the two office plates or masses. 4. Pod glazing: Solar e plus clear solar control low e safety glass. The retail pods on piazza level assume a more fluid geometry than the office plates, which are visually divided through the use of the dark glass in combination with the clear. The selected glass boasts a low U-value and solar absorption percentage. This relates to a lower glass surface temperature, which in turn lowers the radiant temperature experienced. Blinds further assist with glare and thermal comfort. From a Green Star perspective, two IEQ-8 (external views) points were targeted and achieved, as more than 80% of the usable area has a direct line of sight to the outdoors. As a whole, the building achieved a four-star Green Star Design rating and is aiming for a four-star Green Star As Built rating. 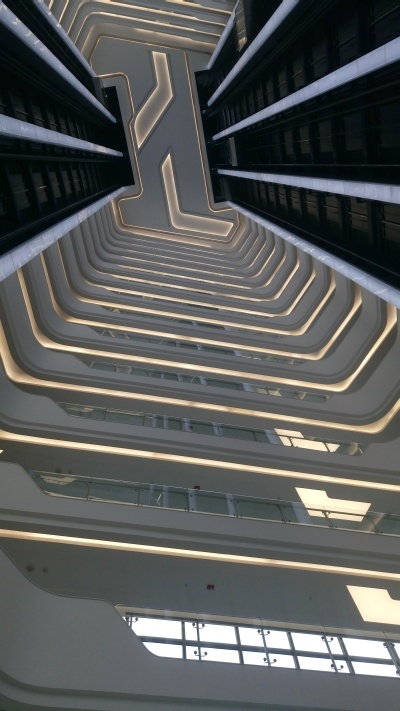 The curved Corian balustrades create an impressive atrium up to the 15th floor. The main entrance of the Bowmans building is easily accessible from the street level through a piazza that connects all three buildings in the Alice Lane Precinct. At the bottom of each of these buildings, a series of pods house food and beverage providers where people can grab something to eat while they relax amongst the intricate landscaping, water features and sculptures. At night, two innovative hydraulic steel gates, hidden in the paving, allow the square to be closed off until the hustle and bustle starts again the next morning. Full thanks and acknowledgment are given to Paragon Architects for the information given to write this article.